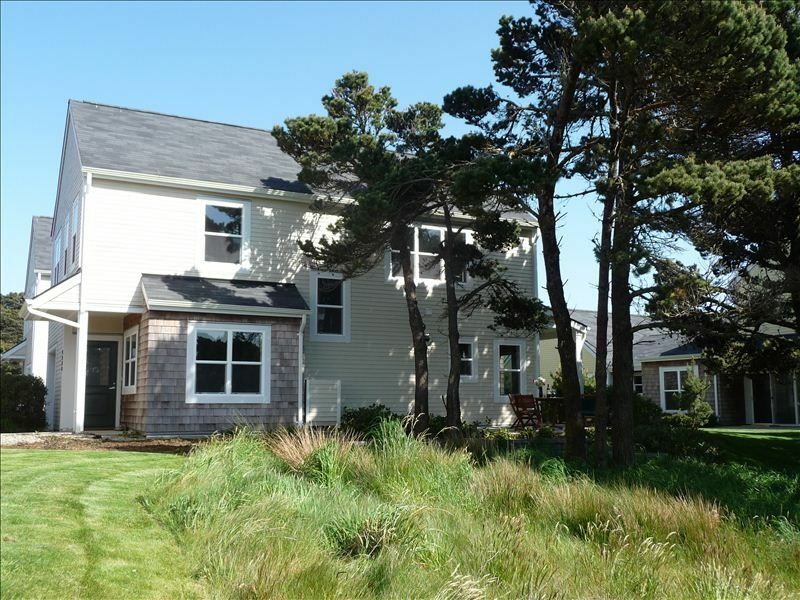 Charming 6 year old family home, perfect for those who want a longer and affordable stay on the beautiful Oregon coast at Bandon. Our sunny home is a wonderful, quiet retreat for relaxing after an invigorating round of golf at Bandon Dunes or Bandon Crossings, walking the spectacular beaches or horseback riding at the nearby stables. There are local restrictions on duration of stay. Please contact the owner for details. Due to family allergies, we respectfully DO NOT allow pets at the home. The rental period however offers the opportunity to use our beach house for extended periods of time, when you want, to share with family, friends or groups. This is a perfect retreat and location for retirees, golfers, writers or artists. There is easy access to downtown Bandon, North Bend airport, the stunning southern Oregon coast and of course the world famous Bandon Dunes Golf Resort. Our family has been coming to this unique location since 1999, three weeks after the Bandon Dunes resort opened and bought this home to be part of this special community. We meet new friends on the beach, at the Bandon Coffee Shop, in the quaint stores, restaurants and on the links every time we are in Bandon. We are sure our guests will do the same! The large gourmet kitchen/ great room is perfectly equipped for entertaining and group cooking of freshly caught crab, seafood dishes or just enjoying meals al fresco with your beach friends. The large en suite master bedroom has a queen bed; one guest room has a lovely pine queen bed; the third guest room having two matching twin sized beds . There is an adjacent full bathroom. The whole home has high 9- foot ceilings with beautiful trim, cherry wood hard floors, gas fire place and granite counters throughout. The overall quality is exceptional, and we have included a cleaning service in the rental rate. Beautifully furnished, high quality designer decorated home. Sunny landscaped surrounding grounds adjacent to lovely wetlands. Custom teak patio furniture for relaxing and entertaining. This 3 bedroom, 2 1/2 bath home is more than the information claims it to be. It is impeccably clean , beautifully decorated and fully equipped with everything anyone could need. In addition, the location is excellent–3 minutes from the beautiful Coquille Point overlook of the Bandon Coast and stairs that lead down to the beach. Old Town is a walkable distance away with interesting shops and outstanding restaurants. In fact, there are many directions to walk and take beautiful photos. We stayed for the entire month of July, and, even though we discovered that July is the windy month, we never tired of being there in such luxurious beauty. Bandon Dunes Golf Resort is only six miles away and well worth many visits to experience the serenity of world class courses without noisy golf carts. Finally, we couldn't get enough of the Cranberry Sweets samples! What a wonderful, welcoming town to visit. Thanks for your kind review. We greatly enjoyed having you both as guests. So glad you were able to experience the magic of Bandon . A wonderful and memorable month. This was a truly wonderful experience in a beautiful home. The area is beautiful and only steps from Coquille Point. Bandon has so much to offer and the owners were so helpful and welcoming. I felt as comfortable as if in my own home. The amenities were exceptional and I highly recommend this home for a memorable vacation. Our home is set in beautifully landscaped, southwest facing grounds. The adjacent wet lands sparkle with the changing light, as the sea breezes play through the pine trees. We are 5 minutes walk from the fabulous Coquille Point beach which offers lovely walks,tidepools, bird watching, seal and whale migrations.